Home > 7 Things to Spring Clean for Better Health! Summer is just around the corner. Before vacation and days-spent-outdoors get in the way, it’s time to clean up! 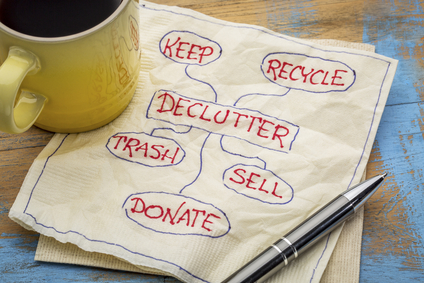 Because let’s face it, the last thing you want to do on a hot Summer’s day is declutter. 1. Your Pantry – Trying to lose weight or eat healthier? Your pantry is the first place you should declutter. The best way to avoid temptations is to not tempt yourself in the first place. Get rid of the high sugar, high fat processed foods by banishing cookies, chips, crackers and other junk you might have in there! Stock your fridge with fresh organic produce, lean meats and good sources of fat. While you’re at it devote some time to prepping your meals, and you’ll see just how much easier eating healthy can be. 2. Your Makeup – Be honest, when was the last time you went through your makeup and checked to see if anything was expired? If you’re like most people, probably never. Though expired makeup may appear fine, it can be harboring invisible bacteria. What’s more, most makeup out there is made with toxic chemicals. Go through your cosmetic bag and toss anything that’s expired or contains ingredients from Eco Expert Adria Vasil’s Mean 15 list. There are tons of amazing natural cosmetics on the market. The Environmental Working Group’s Cosmetic Database can help you make the right decision. 3. Your Clothes – You should feel confident in your clothes. If your current closet isn’t doing it for you, or if you are holding onto clothes that you haven’t worn in years. Get rid of them. Donate them to a local charity, and buy yourself a few new pieces. It’s amazing what a nice outfit can do for your morale. 4. Your Agenda – This one might be a little more difficult, but I promise you it’ll be worth it. Figure out what you want to do less of and cut it out of your schedule. Dread cleaning? Hire a cleaning service. Hate cooking every night? Devote a few hours on Sunday and make your weekly meals then. Obviously, you can’t cut every mundane activity out of your schedule. Things still need to get done! But if an activity is really bogging you down, get rid of it and make time for the things that bring you joy. 5. Your Office – Whether you work from home or in an office, things can get pretty disorganized. Now’s the time to go through the pile of papers you’ve been avoiding. Toss out the old snacks in your cupboard. And wipe down your laptop and keyboard. A clean desk will make even the most stressful job, a little more zen. 6. Your Sporting Equipment –With nice weather creeping in, take stock of your fitness equipment. Do you actually use the equipment and gadgets you’ve purchased over the years? And if you are, what kind of shape are they in? Get the bike out of storage and schedule a tune up. Check to make sure your rollerblades are still in good condition. Treat yourself to a new pair of runners. Set yourself up for outdoor fitness success. 7. Your Relationships – Are you hanging around people who drain you? Who always have something negative to say? Or are completely self-absorbed? Decluttering your relationships may sound harsh but it’s often necessary. Your friends and family should lift you up, not bring you down. If you aren’t getting anything out of a relationship, don’t put so much effort into it. Focus your attention on the relationships that feel right. Who do you want to sit on a patio with, enjoying a great dinner? Make time to nurture these relationships. I hope this blog got you jazzed-up about de-cluttering, getting organized and spending quality time with great people this summer! Happy “cleaning”!